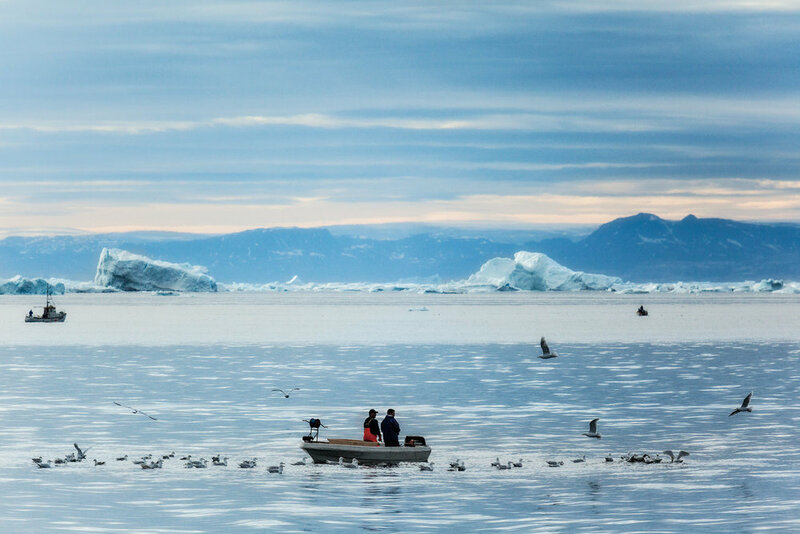 Local fisherman and sea birds on the Ilulissat Icefjord near the town of Ilulissat in Western Greenland. I was nearing the end of a midnight cruise among huge icebergs near the tourist town of Ilulissat in Greenland. It was the early hours of the morning and, not far from Ilulissat harbour, I spotted these local fisherman and the flock of sea birds following them on the magnificent Ilulissat Icefjord. Greenland travel was, for me, a dream come true. And ilulissat, the popular tourist town on the west coast of Greenland, was the perfect place to start my adventure. The light was predominantly blue/grey in color, making for a relatively bleak scene. However, the warm tinge of light in the background and, at a subtle level, in the brighter areas of water and along the tops of the icebergs is, I hope, enough to move the photo's palette and, with it, us towards a more hopeful reading of the photo. I made the photo with a Canon 5D Mark II camera and Canon 70-200 mm f/4 IS L series lens and a Canon 1.4x Extender. In combination the lens and extender produced a focal length of 280 mm. Depending upon the size of the icebergs I was photographing, and the distance between them and my camera, I was changing from telephoto to wide angle zoom lenses. Generally speaking my preference is to photography massive objects, like icebergs, from a relatively close distance. The wide-angle focal length allows you to fit more of the subject into the frame and, at the same time, provides an exaggerated perspective which emphasizes some of the power and majesty of these massive icebergs on the beautiful Ilulissat Icefjord near ilulissat in Western Greenland. Calm water sets off massive icebergs on the magnificent Ilulissat Icefjord near the town of Ilulissat in Greenland. The cruise itself was magical, partly because of the majestic scenery and partly because of my keenness to make good images. I arranged special permission that got me access to the ship's rooftop. As the ship moved into relatively open waters my perch became very cold and quite windy. But I wasn’t moving. I’d come so far. I negated the chill somewhat by lying flat on my tummy which kept the icy wind, whipping off the water and icebergs, away from my body. I lasted all but a few minutes photographing from the rooftop and the stern of the ship. It was an exhilarating experience and one of those times when you really know you alive. The spectacular colors of the midnight sun illuminating icebergs in the Ilulissat Icefjord, Greenland. When I did pop downstairs to the undercover lounge I noticed how most of the other paying customers were chatting amongst themselves, hardly noticing the majestic environment around them. It just proves that, to make great photos, you have to put yourself outside of your own comfort zone. And I mean that both literally and figuratively. Greenland travel is possible and the tourist town of Ilulissat is only a few hours away from many European and North American cities. I just think that, if you’re going to the trouble of travelling into such a pristine and wild environment, you really should embrace the experience of begin outdoors in the air and in the light. Icebergs illuminated by the midnight sun on the Ilulissat Icefjord near the town of Ilulissat, Greenland. I'm very much looking forward to my next visit to Ilulissat Greenland. It’s such a huge country and, while largely inaccessible, the towns and villages like Ilulissat with reasonable tourist infrastructure are simply amazing. Maybe I'II see you there, on a midnight cruise on the magnificent ilulissat Icefjord. I’II be the one lying on my tummy.